Hulu owners Fox, ABC and NBC pass on buyout bids for the second time. Hulu owners may hold on until digital video industry becomes more profitable. The eligible bachelor remains a tease. It's hot and attractive, but the owners of Hulu cannot seem to find an appropriate suitor. DirecTV (DTV) reportedly offered more than $1 billion for the online video site. But Hulu's three owners -- 21st Century Fox (FOX), Walt Disney Co.'s (DIS) ABC and Comcast's (CMCSA) NBCUniversal -- opted not to sell after holding a bidding process for the second time in less than two years. Industry analysts believe Hulu's owners felt like the company could get a better bid down the road. The digital video segment of the industry is burgeoning, and they may want to hang onto Hulu to grow the business -- at least until someone comes in with a more sizable offer. "More and more content is going there and Hulu gives them a test bed that their own individual sites don't," said David Hallerman, a principal analyst at eMarketer. "I wasn't totally surprised that it didn't sell. It's more surprising that they've now tested the waters twice." Related story: Will someone finally buy Hulu? After passing on the most recent buyout offers last week, Hulu owners said they would invest another $750 million into the product. This time around, Hulu owners flirted with what Fox President Chase Carey called "a number of potential partners and buyers. Ultimately his company and Disney are now "fully aligned" in their vision and goals for Hulu, Carey said in a statement released Friday. NBC became a silent partner when it was purchased by Comcast in 2011. But others in the industry are calling Carey's bluff. "At the end of the day it's very clear there's no strong alignment on the path forward," said Steve Beck, a business strategy expert and founder of cg42. The network owners are largely competitors outside their ties to Hulu. They each may may think of Hulu and how it fits into their respective businesses in a different way, Beck said. With its 30 million monthly unique visitors, more than 4 million subscribers, and almost $700 million in annual revenues, Hulu could provide a strong foothold in the video streaming field for a buyer. Hulu dominates the free television show streaming sector, accounting for 43% of total streams in 2012, according to the NPD Group. About 30% of online streams are from the major networks' sites, including ABC, Fox, and NBC. Right now it is primarily a portal for free, on-demand television shows. But, like Netflix (NFLX), it has begun producing its own content, albeit lesser known then the former company's House of Cards. 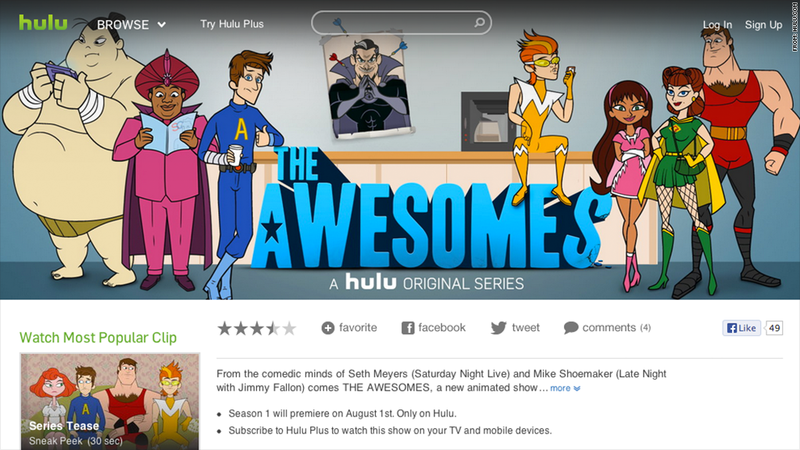 Hulu's own animated show created by Seth Meyers and Mike Shoemaker, The Awesomes, will be released August 1. Significant question marks surrounding the digital television industry remain, but according to Hallerman, "this is the way the world is moving." The networks appear to want to hang tight until it gets there, when Hulu will become more enticing to outside buyers.